When you have a restaurant overlooking Niagara Falls you are bound to be in for some excitement. One of the best parts about being in the heart of Niagara Falls is that we get to meet and serve guests from all over the world. Here’s why we think you should join us. In fact, the walk from our restaurant to Queen Victoria Park is less than ten minutes. So you know that a delicious meal, refreshing drink, or both are on hand once you’ve explored the falls. Queen Victoria Park is also known for its spectacular firework displays. Which are close enough for you to enjoy as you’re relaxing on our patio with family and friends. Of course, the best part about a restaurant overlooking Niagara Falls is… that it’s a restaurant overlooking one of the best views of Niagara Falls. You can sit back with a glass of wine and relax to the muted thunder that rises up the hill from the falls. Not all the restaurants overlooking Niagara Falls are situated right next door to the casino. For a lot of visitors to Niagara Falls, the Fallsview Casino is as much an attraction as the falls themselves. We’re happy to balance out the casino’s high energy excitement with our friendly, fun, relaxed atmosphere. Of course, Niagara Falls is a great place for a family getaway. Being so close to the most exciting family attractions makes us frequent hosts to visiting families. Our kid-friendly atmosphere and menu means that once your little ones are tired out you can admire the view at our restaurant overlooking Niagara Falls. At Coco’s we’re always looking forward to summer. We have a magical atmosphere because our restaurant is overlooking Niagara Falls, and we have a spacious outdoor terrace where you can eat under the stars. But, we also love summer because it’s the season for live music. During the summer months we provide nightly entertainment from seven o’clock onwards. With warm aromas wafting from our ovens, live music, and the open air, dining at Coco’s in the summer is a truly memorable experience. 5. We Have Parking – and it’s Free! Yep! We have ample free parking for our guests. It’s a practical detail, but one not to be overlooked for a restaurant overlooking Niagara Falls, which is bound to be busy. Sometimes negotiating a parking spot can be a real arduous task. So consider our complimentary parking as one more way we’re helping you and your family jump into the action! If you are looking around for restaurants with fantastic views of Niagara Falls, have a look for us. There are so many exciting things to enjoy in and around Coco’s Steakhouse, Bar and Grill. 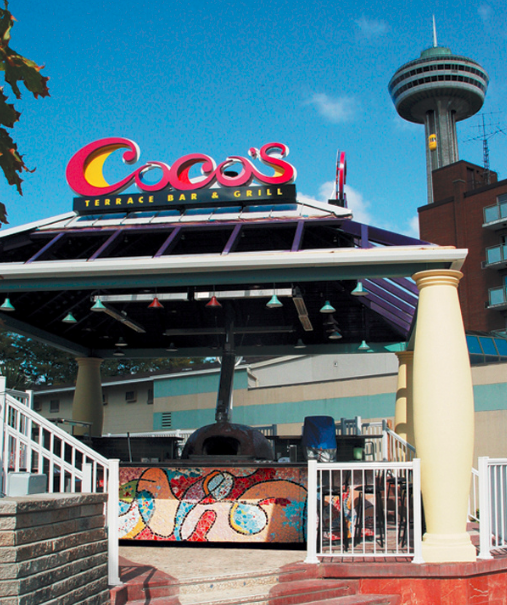 After taking in all that Niagara Falls has to offer, come to Coco’s for a relaxing moment… and take it in a just little more.